Although I was born Catholic I was not raised Catholic – but I am, however, a product of the Catholic school system. Having gone through the Catholic system I did receive all the Sacraments of Initiation such as First Communion, First Confession and Confirmation. However, it was in Grade 10 religion class that I first heard the call to actively return to the Church. We had to do an assignment on one of the seven Sacraments and for some reason I can’t explain the Eucharist really jumped out at me; and so this was the Sacrament I chose to do my assignment on. It was in the course of doing this assignment that I was evangelized by the Church’s teachings on the Eucharist and began to develop an understanding (really for the very first time) of what the Eucharist is; or I should say, of Who the Eucharist is. For some reason, I still can’t fully explain, while doing the research for this assignment, I never doubted or questioned the Church’s teachings on the Eucharist – instinctively I just knew that what I was reading about the Church’s teachings on the Eucharist was true. It was in the course of this that I started to develop a strong yearning to receive Communion as intuitively I became keenly aware that my spirit was in (what I can only describe as: a state of decay) and desperately needed to be nourished by this Sacrament. This prompted me to start attending daily mass; and I remember well the very first time in years that I did receive Communion – it was at a weekday mass at my high school, and almost immediately I felt a difference, and could sense that the Eucharist (which I had just received) was nourishing and feeding my spirit. Soon afterwards, that feeling of my spirit being in a state of decay went away and daily Mass became an integral part of my life. When I look back on this experience, I realize that the Eucharist was at the heart of my call to return to the Church – and in a way that I can’t fully explain or understand, the Eucharist is also now at the heart of my call to the priesthood. In other words, it’s my desire to be deeply united and connected to Christ in the Eucharist that is at the heart of my call to be a priest. For years, I fought this call, feeling that I was not worthy, capable or ready for such an important role and ministry in the Church. 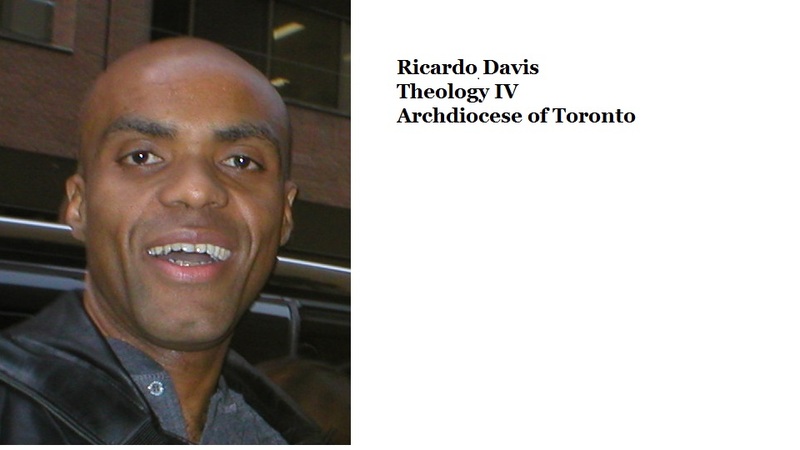 In 2010, I could no longer ignore the call, and with the prompting, support and encouragement of my parish community, St. Michael’s Cathedral, I applied to the seminary for the Archdiocese of Toronto. I still do NOT feel worthy, capable or ready for such an awesome call, but I am now willing to give it my best and I have no doubt that the Lord will be with me every step of the way. Next 29th Tuesday in Ordinary Time: Keep Working at It!